Earth has 7 major plate tectonic boundaries and 10 or so minor ones. 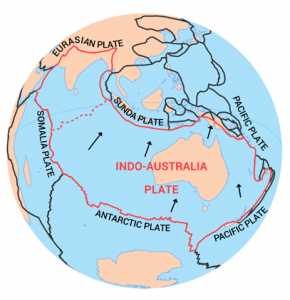 Plate tectonics have deceptively slow movement. Just centimeters each year. But they’re never idle. 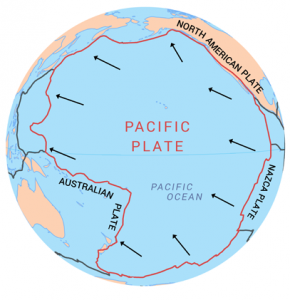 Like seams of a baseball, tectonic plate boundaries wrap around the Earth. Earth’s tectonic plate boundaries are unusual because they can consist of continent and ocean crust. Here are the 7 major tectonic plates of the world in a bit more detail. Pacific major plate is the largest which underlies the Pacific Ocean. Specifically, it stretches all the way along the west coast of North America to the east coast of Japan and Indonesia. 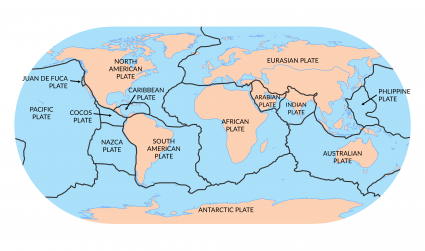 This plate forms most of the Pacific Ring of Fire which has some of the most violent and catastrophic earthquakes and volcanoes on the planet. And smack dab in the middle are the islands that make up Hawaii. The interior hot spot within the Pacific Plate is responsible for the volcanic activity that occurs at the Hawaiian islands. 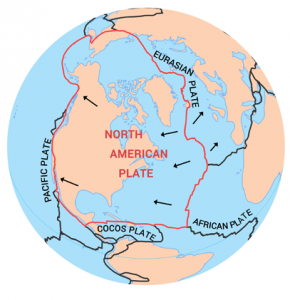 The North American major plate not only contains the continent of North America but also part of the Atlantic Ocean. This plate extends all the way over the North pole and even contains Siberia and the northern island of Japan. It also includes Greenland, Cuba and the Bahamas. The interior of the North American plate contains a giant granitic craton. It’s believed that the North American (Laurentian) craton is 4 billion years old. The west side has a divergent boundary with the North American plate. The south side of the Eurasian plate neighbors the Arabian, Indian and Sunda plates. It straddles along Iceland where it tears the country in two separate pieces at a rate of 2.5 cm per year. 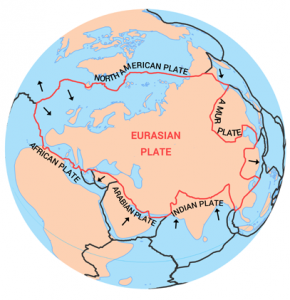 On average, the Eurasian plate moves about one-quarter to half an inch per year. 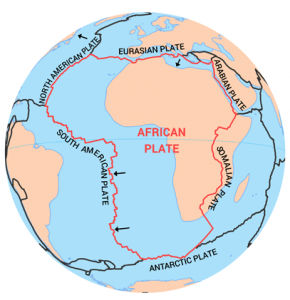 The African plate contains the whole continent of Africa as well as the surrounding oceanic crust of the Atlantic Ocean. Oddly, it looks like a larger boundary of the African continent, itself. The Somali Plate is positioned along the East African Rift zone. This developing rift zone is gradually separating the east part of the continent. 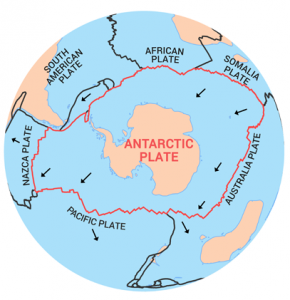 The Antarctic plate holds the entire continent of Antarctica including its surround oceanic crust. This plate is surrounded by parts of the African, Australian, Pacific and South American plates. Antarctica was once grouped as part of the supercontinent Gondwana with Australia and India. But about 100 million years ago, Antarctica broke apart to its current location at the south pole. It’s estimated that the Antarctica major plate moves about 1 cm per year. Australia, India and Antarctica were once connected as the supercontinent Gondwana. As part of the supercontinental cycle, India drifted apart moving northwards. 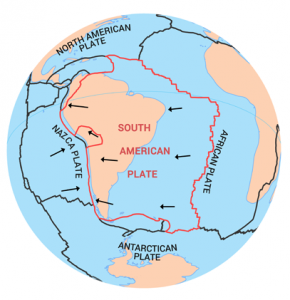 The South American plate is a major plate that includes the continent of South Africa and a large portion of ocean from the Atlantic Ocean. But the eastern edge lies in the Atlantic Ocean at a divergent plate boundary. Alongside the African Plate, these two plate boundaries pull apart from each other creating some of the youngest oceanic crust on the planet.